This map is too congested for the number of people playing in it, so enemies spawn behind you so much that even a drop uplink on the redline gets overrun almost instantly. The map is good, just too small. Nothing makes a map less fun than getting spawned right in front enemies on a regular basis. Can default spawn = not any droplink on the map and be random.The small map our one droplink was over run and they camped it and we couldn't spawn anywhere else. and had to be killed till the spawn was damage from them killing us. Way too small and messy. This map has frequently dying as soon as I spawn. The rock spire in the bottom right corner of D-6 is wonky though. If you're standing on it and fall in the big crack, you get stuck and have to suicide. 2. Unable to make much use of the structures that are just within the red zone. 3. Spawn locations are not random at all (just like all the other ambush maps) as they are quite predictable. 4. Spawn locations sometimes place you out in the open where you can easily get killed. This map is absolute garbage. Can you say CoDumbasses? Agreed, this map is absolutely terrible for Ambush. only immobile crabs.. oh, sorry, campers cry about "too small"
Once a battle gets going it can be funly fast and furious, but many times it's just pure chaos and straight up terrible. Far too small, and this exacerbates all the problems with spawning. Becomes frustrating very quickly as one death almost inevitably beomes two or three with nothing the player can do about it due to where you have spawned. Given that this game is supposed to be funded by people paying real cash for in-game equipment, this map in particular highlights that you're paying to buy equipment you will get no chance to use before you're dead (I appreciate that this is a problem on all the ambush maps). I've played this map a few times now but I think I'll leave the battles on this map in the future. Map is still ******* abysmal. Spawn killing is rampant, and now that player SP is higher there is a extremely obvious need to reduce the vehicle cap down to nothing. It doesn't take much to be good with a tank. The size of the map, awful spawn system, and range of the turrets make this map a waste of our time and money once some ******* brings out a tank (teammate or otherwise). Yup, simply an awful map. It is too small and the spawn points are poorly placed making spawn kills a way of life here... I never use an expensive fit on this map because of the significant losses this map inflicts. This map plays differently now, did they do something with the spawns? I noticed that teams tend to spawn on opposing sides now rather than all over the goddamn place. This is probably for the best but I do kinda miss the general confusion this map used to provide. Battles on it seem a little more ponderous and slow now. It also feels like the team spawning on the right side have a slight advantage in terms of cover and since the other team can't be displaced from their side I can see it being very one-sided. Also my main complaint is that this is the only map I'm decent at, now I can't sneak up on snipers on the high rocks all day long. I've only played it twice today so perhaps this spawn thing is all in my imagination but it does feel very different. I agree that it is very one sided. Anyone who has control of the east side will have major advantages. Snipers have the rock spires to give them the high ground while assaults and heavies have the center that has a natural defense towards the west. Those on the west side are generally trapped unless they are fast enough to sneak through the redline. Even then, the redline can be used mostly against them by other scouts who know them well enough. If you guys can at least move either the west or southern redline a little further back, you might be able to give the folks stuck in the west side a fighting chance. Re-posting in this thread. I posted to another thread about this. We are currently doing some work on the Manus Peak ambush. I am considering extending the game-play area into a couple of the smaller infrastructure areas along the C row to allow for some more diverse play. What are your mercs feelings and or thoughts about that? Sure,if you could add more infantry focused areas it would work well. I like this. If you decide to add them, put them some distance away from the middle where the pointed rocks are. The battlegrounds are designed for the Skirmish game play. We then add upon those defined areas with our OMS and Ambush. So we currently have to use the areas that exist. What I have done is extended the ambush area to include the three smaller infrastructure areas to the north of the current space used in Ambush. So this area is no longer very small and will have some more interesting areas to play in. That's good to hear LogicLoop. I'd like to see some more room to move in most of the Ambush maps. The large socket ambush maps like Skyfire, Biomass, and Communications actually work well outside of their continued performance issues. To me Manus Peak was distilling (unfortunately) some design directive to "speed up" the maps in Ambush. Was this actually a design directive? 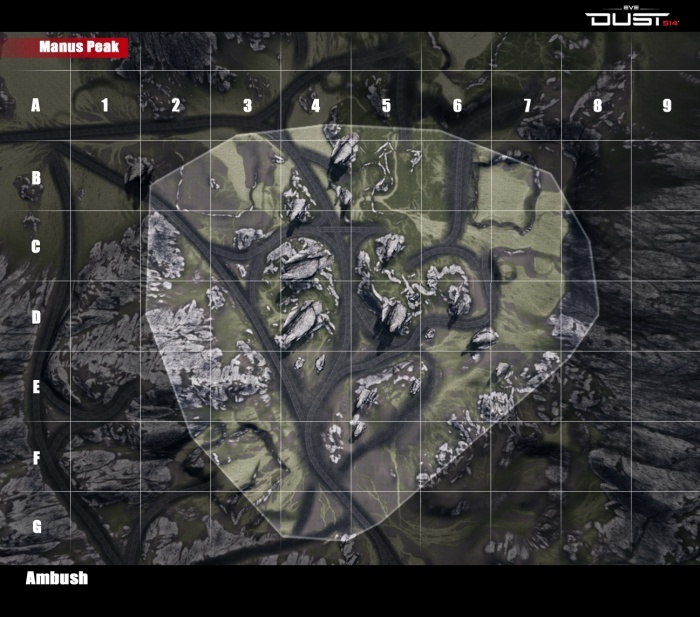 I found the ambush maps like the Rocket Launch pad considerable less fun after the redlines shrank in Oct/Nov. I like roaming a bit in ambush and finding some smaller fights with my squad. This is almost impossible to do in the ambush maps with shrunken redlines like Rocket Pad and the Line Harvester map. Also, what are these invididual small sockets/assets called? "tabletop", "truck thing"? "big square things with truck things underneath"? This map quickly becomes imbalanced when tanks are brought in. It is just way too small for that type of playstyle. Team A brings in tank in first and drives around the map in a circle mowing everyone down. Team A prevents team B from deploying a counter tank with their tank. Team B has nowhere to run or safely spawn/rally with AV fittings/plans. That is not always how it goes, but it is a pretty common outcome. When everyone plays infantry only however the map is usually pretty fun. The ambush in this map has gone through several iterations. Nightly we play test maps that we have focused on during the week. On some occasions we can not fill up our tests with maximum player counts. When this happened on this ambush map, it felt far to big. So we shrunk it down, and it seemed to play well. However, once in the public hands, clearly it was far too small. So we made the decision to adjust this to our community's requests as best we can. It is currently going through testing again, and we are ensuring we have maximum players for these tests. So in short, this was a group decision to make it small. It is now a group decision to expand the area and find a better sized play area for our players. I am not sure I understand your question about the small socket / assets. I would love to join you guys in IRC some time. But right now I am incredibly busy. One day my you may see me arrive randomly though. can you guys not fill it with bots to simulate a public match? We do not have bots. We have full playtests now. We make sure of it. Sorry, CCP LogicLoop, I think I misread your original post on the subject. Are you saying that you are adding more space to the map or are you adding buildings to the current one? The red line area has been expanded. It now includes four of the structured areas that are in the Skirmish map. This gives more "space" for the players to move around, with a few more interesting areas to battle in, rather than a bowl of rocky death.